Clicking this tab will display a compact window. If you are new to the website or have not yet logged into your store account, you will see this message. If you have already registered with our website, and logged into your store account. You will see a screen similar to this. 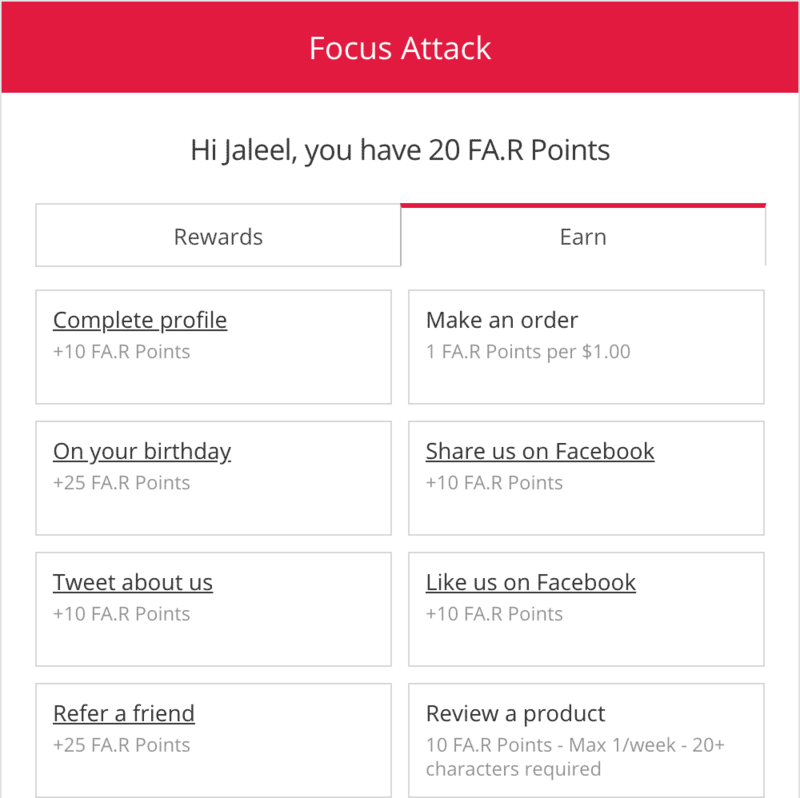 This displays your current points, plus each of the available rewards you can unlock once you have enough points. 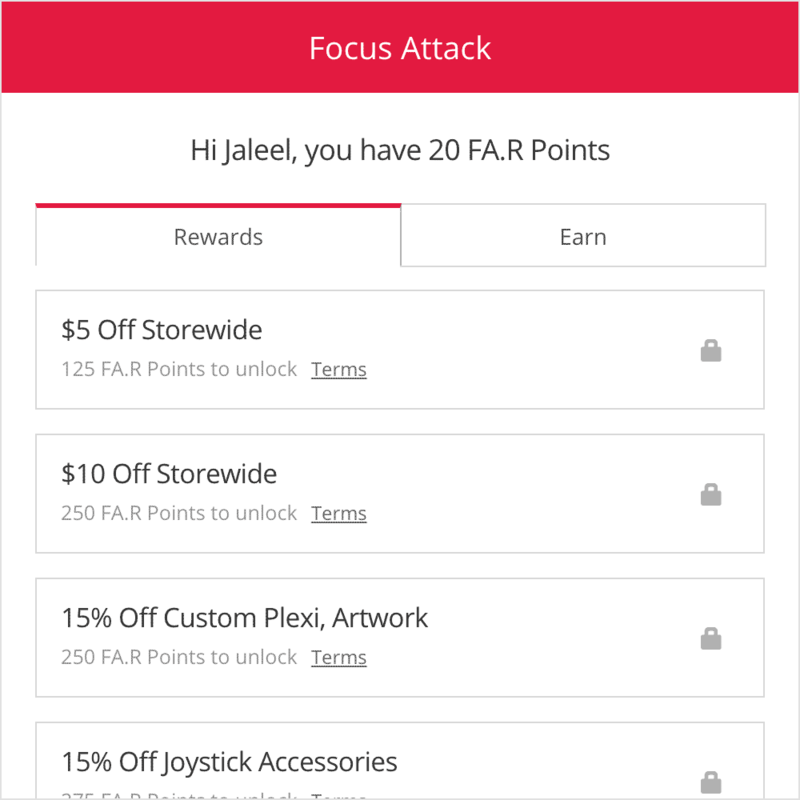 Clicking on the "Earn" tab will display each of the methods you can use to earn FA.R Points, such as joining us on Facebook or Twitter, sharing or tweeting, reviewing products you've purchased, or referring a friend that registers and completes a purchase. Under the new FA.Rewards program, you have one full year to redeem your FA.R Points. To clarify, as new points are added, those points will last one year, and older points will expire once they reach one year if not redeemed. What if I don't Use my FA Account for a Year? Older accounts that have zero FA.R points and also are unused after a year will be removed from the FA.R program. This does not mean that your account at FA is removed. Should you make a purchase after your FA.Rewards account is removed, you are automatically added back in, and points will again accumulate in your account. 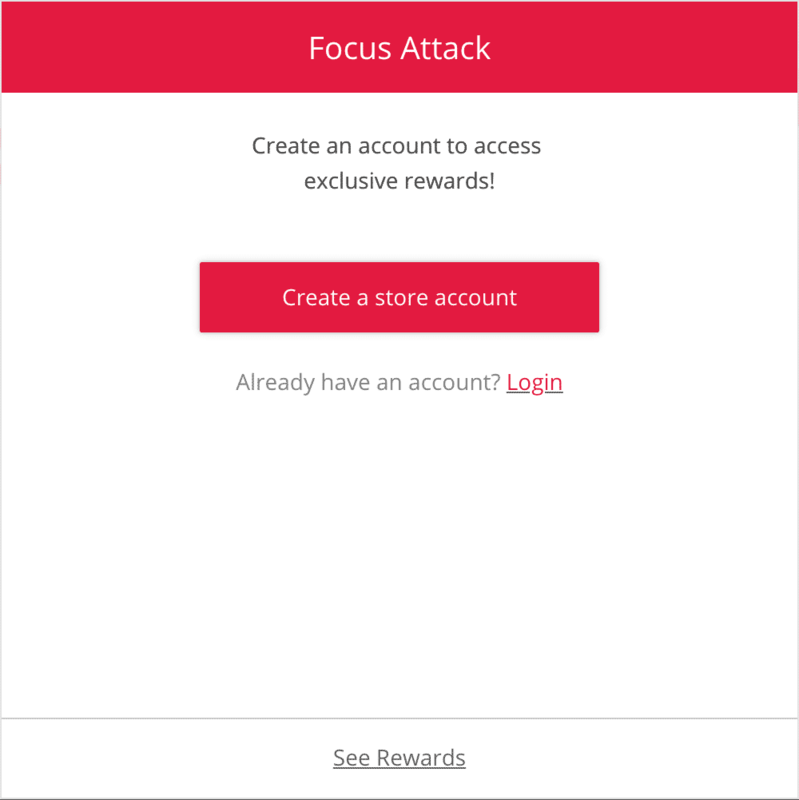 I registered to the original FA.Rewards Program, but do not See Reward Points. What can I do? What Happened to the original FA.Rewards? In November 2018, we noticed that some users were experiencing issues accessing our FA Rewards feature. Attempts to contact the service hosting the rewards program and restart the server were unsuccessful until late December, when the server went down for good, and the team responsible for its upkeep was non-responsive. They left a lot of its clients - including us - out in the cold. Until recently, there was no way to recover customer data. I was lucky to get the majority of it through persistence and a helpful internal source. With that data in hand I've completed transitioning to a new program. Part of the challenge is converting the previous system into the new one, as the points system differs across the two. The 1 Gold chip = 1 FA.R Point, 1 Blue chip = 25% FA.R Point is the calculation we chose to convert the original program's gold and blue chips. Additionally, some accounts were removed as the customer information was incomplete, however, I do have email addresses and points from all customers available to the program. This is why I suggest contacting our order fulfillment team (orders@focusattack.com) should you not see points in your FA.R account, or do not see an account at all. As we continue to introduce the new FA.R program, I hope to have more updated information to you soon.